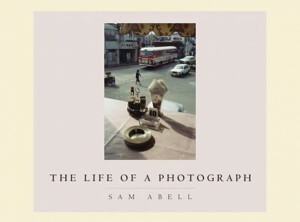 One of the most impactful books I’ve read about photography. Very little words, except the thousands in the photographs. Any number of gurus, books, lectures on photography will tell you how important it is that a photograph tell a story; but until I read this book, I really didn’t understand. I can give no better testimonial to the book than tell you a little story that the book inspired in my own photographic efforts soon after I read it. 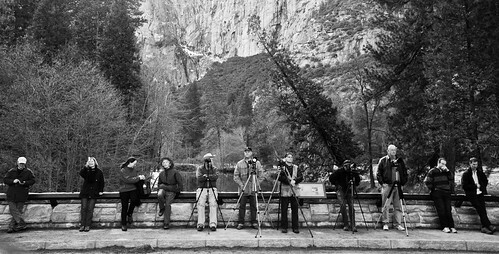 We were in Yosemite with friends a couple of weeks ago, on the cusp of winter and spring. It was still snowed in, and the views were breathtakingly beautiful. An hour before sunset, a posse of photographers gathered on Sentinel Bridge to capture the majestic Half Dome bathed in the last rays of the sun. Unfortunately, nature had other ideas; and we waited in vain while a cloud obscured half dome all the way till darkness. If I hadn’t read Abell’s book, I might have gone back disappointed. Instead I made this photo, the pros with their cameras and the amateurs with theirs – there’s even a phone camera in the mix – all restless and, by this time, resigned to not making that ideal sunset photograph. There’s a sense of irony and bemusement that I’ll always remember. Click on the image for a larger version. This was written by Anshul. Posted on Wednesday, March 31, 2010, at 10:53 am. Filed under books, photography, photos. Bookmark the permalink. Follow comments here with the RSS feed. Post a comment or leave a trackback.